Cartoon by Pablo Helguera, via npr.org. Classical music. When you hear those words, do you feel daunted? Bored? Do you feel a sudden need to run the other direction? Or maybe you just roll your eyes and tune out? We know how you feel. 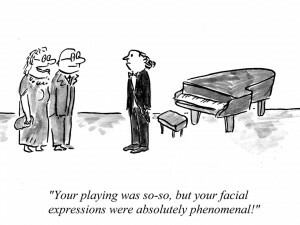 And we’re here to share the many wonderful ways classical music can warm your soul or give you a hearty laugh. Really! From podcasts, to videos of Mozart “doing stuff,” to articles on a variety of topics, we have an endless musical playground for you to explore. Watch some videos! Mozart Does (wacky) Stuff, Super Bowl commercials, and more. Read about classical music in the movies. Learn about some great composers and listen to their music. Listen to our monthly five-minute(ish) podcast. Do you like trivia? We have that too! Text SALON97 to 41411 to get a weekly trivia text message from us! Loads of fun. We also have a Last.fm station and an Rdio channel to keep you company during the workday. Come listen with us! You can also support Salon97’s programming by making a donation via the “Donate Now” button on our Fractured Atlas page! Contributions are tax-deductible and directly support our work.